PHOTO: Harriot Stanton Blatch, founder of the Equality League of Self-Supporting Women in 1907, which five years ago became the Women’s Political Union. 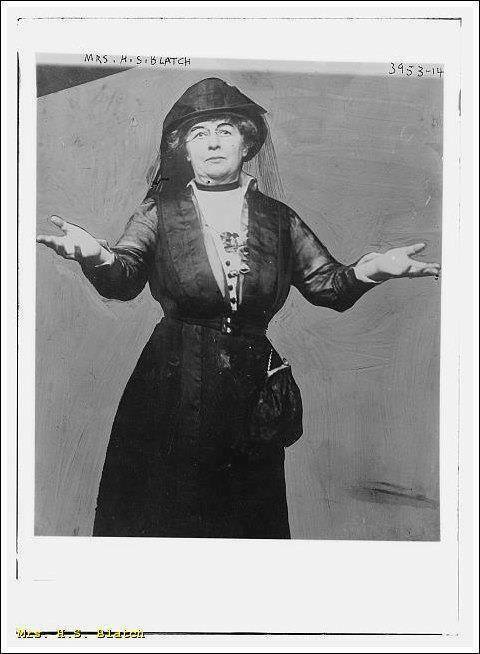 December 18, 1915: Though New York State’s suffrage referendum went down to defeat on November second, Harriot Stanton Blatch said today that she and a number of other suffragists are still determined to cast their votes in next November’s Presidential election, and have figured out a way to legally do it. How? Well, since a ballot box that accepts women’s votes won’t be available at their local precinct, they’ll go to the nearest one that – under the right circumstances – will accept their ballots. It’s in Kansas. There will be a meeting in January to make definite plans, with Blatch leaving in March, and the others in April, which will make them all Kansas citizens in time to register for the election. Already there are a number of well-known suffrage pilgrims pledged to make the journey. Dora Lewis, active in Alice Paul’s militant Congressional Union for Woman Suffrage; Mina Van Winkle, head of the Women’s Political Union of New Jersey, and Blatch’s sister Margaret have signed on. With the bleak outlook for suffrage referenda after the defeat of the drives in Massachusetts, Pennsylvania, New Jersey and New York in just the past two months, the idea is appealing because enfranchisement could be gained quickly, and with certainty, at least for some. Whether this is the start of a women’s migration to the West, or whether the recently-disappointed suffragists will decide to stay after all, and have another try at making New York the first full-suffrage State East of the Mississippi River, it’s proof that even after a quadruple defeat, those who believe in political equality for women are just as determined as ever, and will eventually vote one way or another.